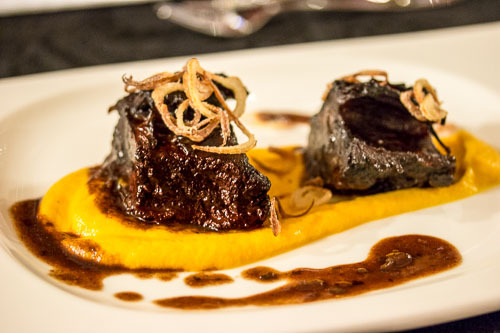 Cooking the short ribs sous vide is similar to a long braise in the oven. 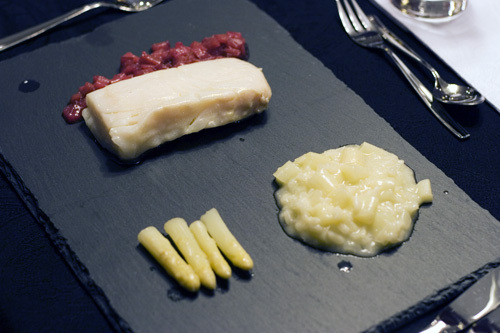 Here, though we are able to keep the temperature at a constant 144°F so the collagen and muscle slowly break down without the meat becoming tough and chewy. 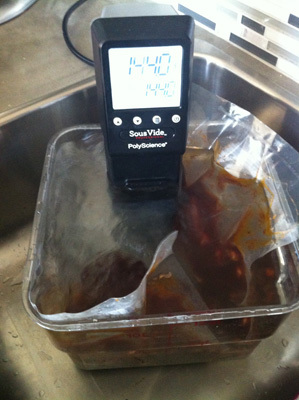 The sous vide bag also keeps all the flavors inside rather than losing them through evaporation. The ribs will take 48 hours to cook, so plan this dish well in advance. The good news is once they are done, they can be chilled down quickly in an ice bath and kept in the refrigerator for up to 5 days. In fact that only enhance the flavor! 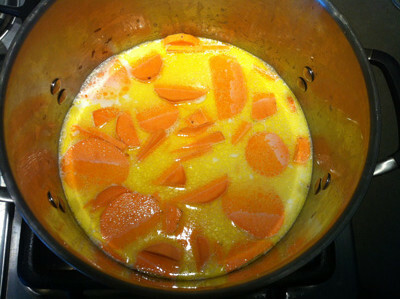 If you are doing them ahead, just pop them back in a 144°F water bath for 30 minutes to reach temperature. 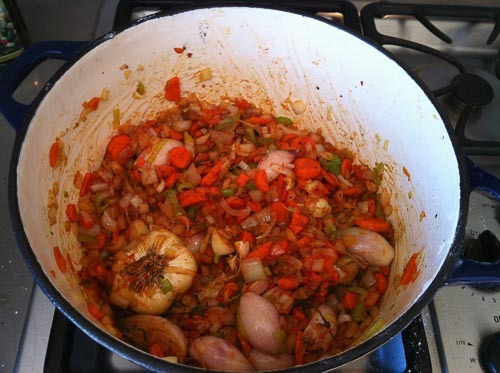 Otherwise, start the potatoes when the short ribs are finished cooking and you are ready to start the sauce. 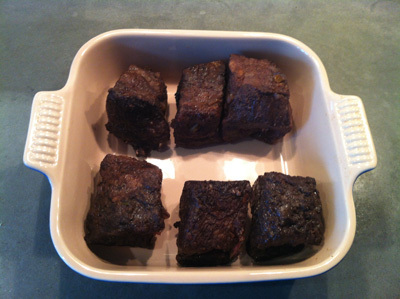 Generously season the short ribs on all sides with salt and pepper and then lightly dust with flour. 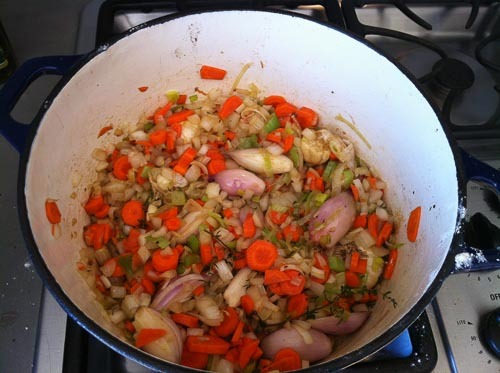 Turn the heat down to medium low and add the onion, carrots, celery, shallots, leek, garlic, and thyme. 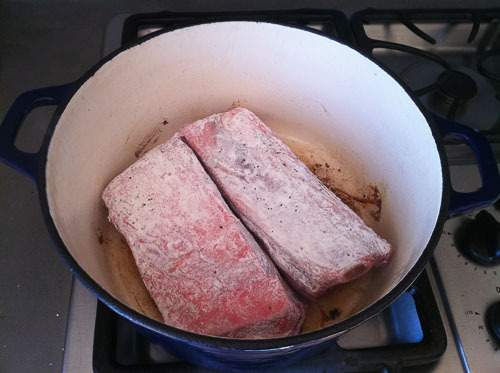 Place the short ribs into large sous vide bags leaving enough room for the liquid and vegetables. 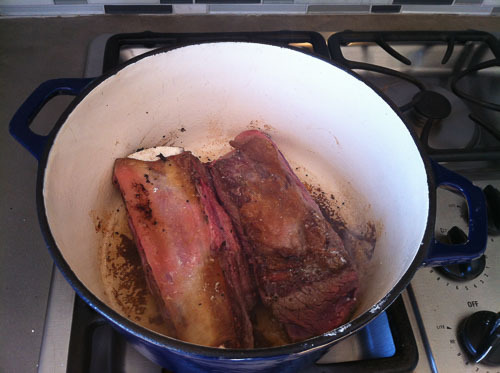 Depending on the size of your short ribs this should be around 2 per bag. 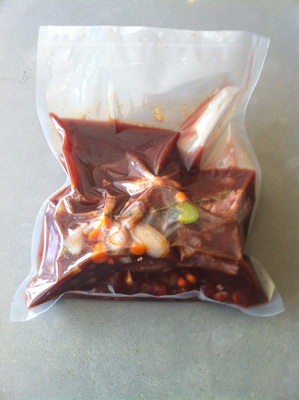 Carefully distribute the vegetable and liquid mixture among the bags and seal in a chamber vacuum sealer or using the displacement method. 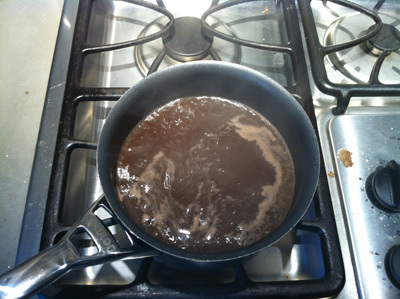 Plate the short ribs, ladle the gravy over top, and garnish with the shallot rings. 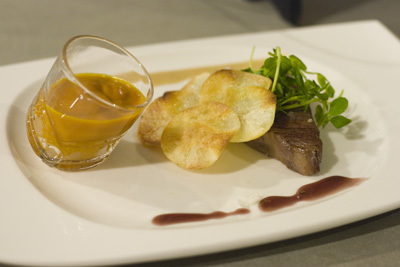 Plate the sweet potato puree and enjoy!